If there is a “genius loci” an ugly object could never be produced by Ciam of Petrignano. The company is set in the green plain between Bastia Umbra and Petrignano. Looking up on one side there is the white Assisi towering at the feet of the Subasio, on the other side there is Perugia’s Acropolis. We are a few kilometres from the “centre of the world”; in that land that inspired the most venerated Italian mystics and influenced the great painters and architects of Italian art. Federico Malizia – young heir of a family tradition that began in 1977 and since 2006 president of Ciam (Costruzioni Italiane Arredamenti Moderni) – is aware of this privilege. “One works better in a place like this”, he explains from behind the desk of his office furnished in pure Ciam style, in the 23,000 square metre headquarters inaugurated in 2010. 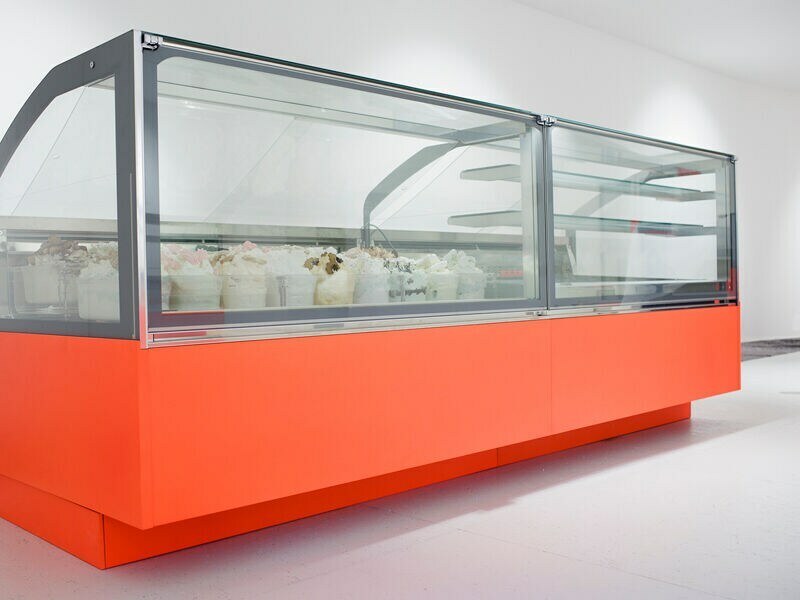 The company produces furniture for bars, pastry shops, ice cream shops and restaurants. This year they celebrated 40 years with a series of sizable investments in personnel, technology and communication. 20 new assistants have been employed, an important cell has been bought from SCM, which includes an automatic Mahros Flexstore EL magazine and a Gabbiani Galaxy 2 panel saw and the company presented itself in grand style at the main shows of the sector (Euroshop in Dusseldorf and Sigep in Rimini). Moreover Ciam is preparing a large event for its customers to coincide with Host in Milan in October. 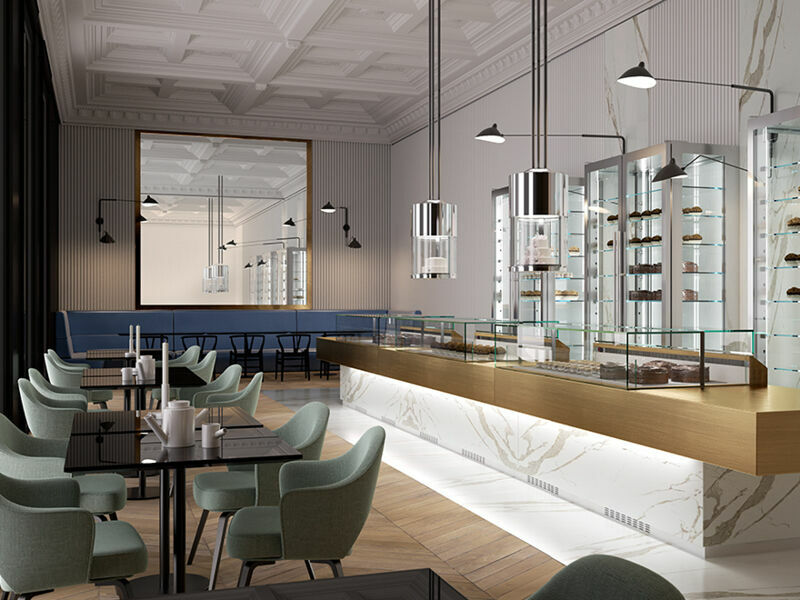 If that wasn’t enough the company has set up the Ciamuseum which, as well as being a showroom to present its production, features spaces to welcome its customers and work in an exquisite space. “We’ve come a long way”, explains Federico Malizia. “The company that my father Giuseppe set up began with three employees and it built countertops for shops. In the eighties we moved to the production of modular furniture for bars and display cabinets for pastry shops. At the end of the eighties we moved to larger premises and changed our target. We no longer dealt directly with the end clients of the HoReCa sector, but we started working with shop fitters and designers for whom we produce every type of furnishing. Our catalogue mirrors this growth. At the beginning we had 100 products, now we have reached 14,000. We work directly with clients such as Eataly, Illy, McDonalds, Starbucks and with designers creating bars and restaurants worldwide”. “Since 2008 the world has changed and we had to reinvent ourselves. Before we only exported 10% of our production, in 2016 our export quota reached 50%. We took ourselves out of the fray of companies competing with each other only on price. We chose a mid to high end target, with custom and made to measure creations, and this turned out to be the right choice”. The company has 120 employees and various departments (machining metal, wood, glass and cooling systems). The impression is that as well as technology there is still a lot of craftsmanship involved? “Of course, as well as on the products, we invested a lot on the materials, pushing the customisation to the maximum. We present innovative materials such as every kind of steel and metal, resins, burnished brass, porcelain stoneware as well as every kind of wood. In other words we pursue every new and captivating shape, which is the added value of our product. We have developed a genuine culture of beauty, of knowing how to make things and we always maintain great flexibility. On the one hand there is the technical office, which is a veritable pit bull, constantly thinking about new solutions, tracking state of the art materials and using the latest software; on the other we have true craftsmen who are exceptionally proficient in creating the products. Italy is a manufacturing country and travelling the world one realises that we can count on people with extraordinary manual skills that the rest of the world envies us”. What differences are there between the production for Italy and the production for export? “In the United States, our main market, there is a culture of the solid, functional and beautiful product, without any excessive refinement. In the middle-eastern markets we have created some truly exceptional products, such as very high, giant refrigerating cabinets. In Europe the aesthetic aspect is very important and the designers that we work with constantly come up with new solutions and materials”. Your relationship with SCM has consolidated over time. How has it changed and which machines do you use? “We have been working with SCM since the middle of the nineties. Currently we have an SCM Tech z5 five axes work centre and a series of classic SCM machines that help us in the various machining operations. This year we decided to invest heavily in the woodworking workshop to bring it up to the same level as the metal department, therefore we have made the same conceptual choices: a Mahros Flextore EL 14 station storage which lets us place a different material in each station. 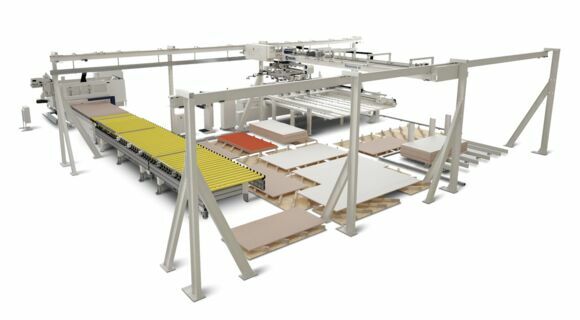 The magazine supplies a Gabbiani Galaxy 2 panel saw (that replaces a SCM Sigma 90 panel saw) which can machine with speed and precision and on “batch one” productions. This cell has been active for a few months and since then the overall production has been simplified. Now we can do something in two hours that beforehand used to take us a day and a half. The electronics linked to the panel saw are also an important step forward: we can label the product with the client’s name, a solution that, for example, we need to be able to bring over to the metal department, where we still have to manually label the individual pieces”. “Skills are fundamental in our sector. The quality of the product comes from the quality of the people and we are very committed to training. It takes years to adequately train a person, especially in departments where manual skills are still significant and where craftsmanship and knowledge of the product is refined only with time. When the company grew quickly we found we had to choose between going on hiring drive or limiting the production. We decided to invest in people, who are the added value in our high quality production. This year we have implemented welfare initiatives to reward the employees. It is an innovative idea for companies in our sector and of our size which includes: telemedicine sessions, tests and examinations, tests on food intolerances, posture, mole mapping…”. How do you see the near future? “We will focus on foreign markets that demand high quality Made in Italy products. We will certainly continue producing all our products in-house, with a strong organisation that can perfectly combine state of the art technology with the values of craftsmanship.